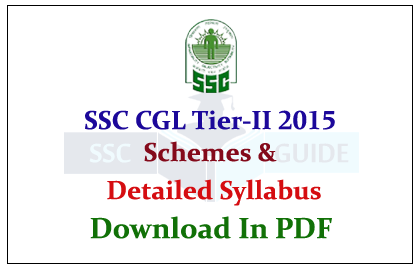 Staff Selection Commission CGL Tier-II Exam Syllabus and its Schemes are given here. Candidates those who are all wrote tier- I exam and have confident about result can start your preparations for Tier-II examination. 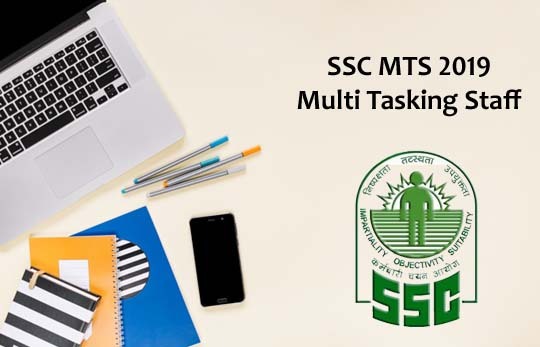 Tier-II of the Combined Graduate Level Examination -2015 will be of Objective Type Multiple Choice and will be conducted over two days during a weekend. It will consist of three different papers/subjects and depending upon the category of posts applied for, the candidate will be required to appear in one, two or three papers, as the case may be. 2 Hours and 40 Min. 2 Hours. and 40 Min. 1. The Commission will have the full discretion to fix separate minimum qualifying marks in each of the papers and in the aggregate of all the papers separately for each category of candidates (viz. 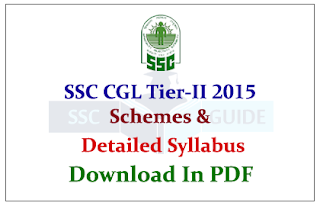 SC/ST/OBC/PH/ExS/General (UR) ). Only those candidates who qualify in all the papers as well as in the aggregate would be eligible to be considered for being called for the Personality Test/ Interview and/or Skill Test. 2. There will be different set of Questions for the papers on Arithmetic & General Studies for Visually Handicapped (VH) candidates which shall not have any component of Map/Graphs/Statistical Data/ Diagrams/Figures/Geometrical problems/Pie-chart etc. However, components of other papers will be the same as that for general candidates. · Ratio and Time etc. · Phrases and Idiomatic use of Words,etc. · There will be a question on passages and Comprehension of passages also. (The standard of the questions will be of 10+2 level). of India, Ministry of Home Affairs. Probability, Probability Distributions, Binomial, Poisson, Normal, Exponential. Compilation, classification, tabulation of Statistical Data, Graphical presentation of data. Measures of central tendency, measures of dispersion, measures of association and contingency, scatter diagram, correlation coefficient, rank correlation coefficient and linear regression analysis ( for two or more variables ) excluding partial correlation coefficients. Concept of Population, random sample, parameters, statistics, sampling distribution of x properties of estimators and estimation of confidence intervals. Principles of sampling, simple random sampling, stratified sampling, systematic sampling etc., Sampling and non-sampling errors, type-I and type-II errors. Concepts of Hypothesis – Null and alternate, Testing of hypothesis for large samples as well as small samples including Chi-square tests ( Z, t, F, 2 tests ). Demand and Supply Analysis, including Laws and Interaction of Demand and Supply. Production Function and Laws of Returns. Commodity Pricing – Characteristics of various Market Forms and Price Determination under such Market Forms. Theory of Factor Pricing – Rent, Wage, Interest and Profit. Theory of Employment – Classical and Neo-classical Approach. Keynesian Theory of Employment – Principles of Effective Demand. Meaning and Importance of Investment, Relation between Saving and Investment, Multiplier Effect and the process of Income Generation, Post Keynesian Development. Nature and Functions of Money, Value of Money, Fluctuations in the value of Money – Inflation and Deflation, Monetary Policy, Index Number. Statistical Investigation – Meaning and Planning of Investigation. Collection of data and editing of data. Presentation of data – classification, tabulation, etc. National Income and Accounting – Estimation of National Income, Trends in National Income, Structural changes in the Indian Economy as seen in National Income Data. Agricultural sector – Agricultural Development during Plan Period, Rural Credit, Agricultural Price Policy, Rural Development Co-operation and Panchayati Raj. Industrial Policy and Industrial Development. Problems of Economic Development – Indian Planning – Objectives, Techniques and its evolution, Five Year Plans and Role of National Development Council. Profile of Human Resources – Population and Economic Development, Demographic Profile of India, Nature of Population Problem – Poverty, Inequality, Unemployment Problem, Labour Problem, Population Control and Government Policy. New Economic Policy and Welfare Schemes. Indian Public Finance – Indian Revenue, Foreign Aid. Indian Banking and Currency system. Algebra: Algebra of sets, relations and functions, Inverse of a function, equivalence relation. The system of complex numbers, De Moivere’s Theorem and its simple applications. Relation between roots and coefficients of a polynomial equation- Evaluation of symmetric function of roots of cubic and biquadratic equation. Algebra of Matrices: Determinants, Simple properties of determinants, Multiplication of determinants of orders two and three, Singular and non-singular matrices. Inverse of a matrix, Rank of a matrix and application of matrices to the solution of linear equations ( in three unknowns ). Convergence of sequences, and series, tests of convergence of series with positive terms, Ratio, Root and Gauss tests. Analytic Geometry: Straight lines, Circles, System of circles, parabola, ellipse and hyperbola in standard form and their elementary properties, Classification of curves second degree. Differential Equation: First order differential equation. Solution of Second and higher order linear differential equations with constant coefficients and simple applications. Differential and Integral Calculus: Limit, continuity and differentiability of functions, successive differentiation, derivatives of standard functions, Rolle’s and Mean-value Theorems, Maclaurins and Taylor’s series ( without proof) and their applications, Maxima and Minima of functions of one and two variables. Tangents and Normals, Curvature, Partial differentiation, Euler’s theorem for homogeneous function, Tracing of curves. Standard methods of integration, Riemann’s definition of definite integral, fundamental theorem of integral calculus, quadrature, rectification, volumes and surface area of solids of revolution. Statistics: Frequency distributions, Measures of central tendency, measures of dispersion, Skewness and Kurtosis, Random variables and distribution function, Discrete distributions, Binomial and Poisson distribution, continuous distributions, Rectangular, Normal and Exponential distributions, Principles of least squares, correlation and regression, Random Sampling, random numbers, Sampling of attributes, Large Sample tests for mean and proportion, Tests of significance based on t, F and Chi-square distributions. Accountancy: Conceptual framework, Income measurement, Final accounts, Accounting for partnership firms, Hire-purchase accounting, Corporate accounting ( Issue, forfeiture and re-issue of shares ). Business Organisation: Business objectives, Business environment, Business entrepreneurship (including location, choice of form of business and growth strategies), Business operations including finance, production, marketing and human resource development. Micro-economics: Price-mechanism, Theory of consumer behaviour, Elasticity of demand, Production function, Theory of costs, Market structures, Price-determination under perfect competition and monopoly. Indian Economics: Issues involved in planning for economic development, Sectoral analysis of Indian economy including agriculture, industry and foreign trade. Business Statistics: Analysis of Univariate data involving measurement of Central tendency and dispersion, correlation and regression analysis, index numbers, analysis of time-series, Theory of probability. Business Law: Indian Contract Act, 1872, Sale of Goods Act, 1930, Partnership Act, 1932 and Negotiable Instruments Act, 1881. Company Law: Kinds of companies, matters involving incorporation of company, shares and share capital and matters relating to issue and transfers of shares, members of a company, management of a company, meetings and resolutions, winding up of a company. Cost accounting: Procedures involved in cost accounting, marginal costing, cost-volume profit analysis, Budgetary control, Standard costing. Income Tax: Basic concepts, Residence and tax liability, heads of income. NOTE - 1: In Numerical Aptitude paper for Visually Handicapped candidates of 40% and above visual disability and opting for SCRIBE there will not be any component of Map/ Graphs/Statistical Data/ Diagrams/Figures/Geometrical problems. NOTE - 2: The Commission shall have the discretion to fix different minimum qualifying standards in each subject of the Tier-I Examination taking into consideration among others, category-wise vacancies and category-wise number of candidates. Only those candidates, who have scored above the cut off marks fixed by the Commission would be required to appear in the Tier –II Examination. NOTE:3 Tier-I will be used to screen the candidates for appearing in Tier-II for various papers which will be specifically required for different groups of posts. However, marks of such screened candidates in Tier-I will be taken into account for final ranking of candidates for selecting them for the interview and also final selection.